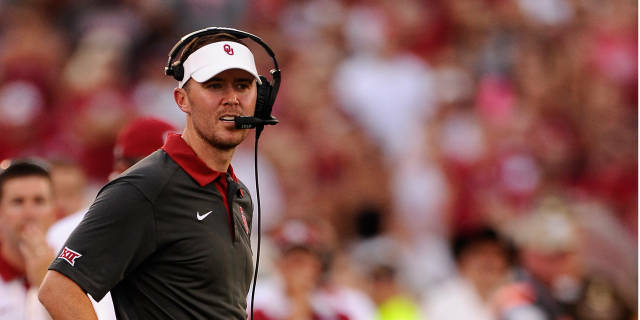 The overseer of what has been the nation's best offense the past two months, Oklahoma offensive coordinator and quarterbacks coach Lincoln Riley was named the 2015 Broyles Award winner as the nation's top assistant coach on Tuesday. Riley was honored during a luncheon in Little Rock, Ark., that included fellow finalists Kirby Smart (Alabama), Kendal Briles (Baylor), Brent Venables (Clemson) and Gene Chizik (North Carolina). In its 20th year, the Broyles Award was established to honor legendary Arkansas head coach Frank Broyles, who had a track record of producing some of the most successful assistant coaches in college football history. Former OU head coach Barry Switzer was one of them. "It's a huge honor and it's representative of this team," said Riley, 32, of the Sooners. "It's not about any individuals; it hasn't been all year. It's been a team effort and it's great to see the program, Coach (Bob) Stoops and everybody get recognized with something like this. It's very, very humbling and it shows what a great year it's been for the entire program. "As far as coaching, Frank Broyles is about as good as it gets. I kept up with the old Southwest Conference days, so to have his name on the award definitely makes it extra special." On the Oklahoma campus for less than a year, Riley has developed the Sooners' offense into one of the top units in the country. He has OU ranked third nationally in passing efficiency rating (172.85), third in scoring offense (45.8 points per game), sixth in yards per pass attempt (9.3), seventh in total offense (542.9 yards per game) and 18th in passing offense (307.9 yards per game). Going back to and including OU's game at Kansas State on Oct. 17 (span of seven contests), the Sooners lead the nation in total offense (592.9 ypg), offensive touchdowns (46), total points (364) and points per game (52.0). Specific to the position he coaches, Riley has helped two-time walk-on Baker Mayfield develop into one of the nation's top quarterbacks. One of three finalists for the Davey O'Brien Award, Mayfield ranks No. 2 nationally in yards per pass attempt (9.6) and pass efficiency rating (178.9), No. 6 in passing TDs (35) and points responsible for per game (21.0), and No. 7 in pass completion percentage (.686). He has accounted for 42 touchdowns and only five turnovers on the season (8.4 to 1 ratio) and has helped OU surpass 500 yards of total offense in nine of 12 games, including in each of the last seven. "We're all really happy for Lincoln," said Stoops, who hired Riley last January. "He's shown excellent leadership with our players and staff, he's a great communicator and he has done a remarkable job in taking us the direction we wanted to go. Obviously the passing game has flourished under his guidance, but keep in mind we've also rushed the ball as well as anybody in the country the last seven games. He's done an excellent job all the way around." Riley, the fifth Oklahoma assistant to be a finalist for the award since its inception in 1996, is OU's third winner. Former offensive coordinators Mark Mangino (2000) and Kevin Wilson (2008) also took home Broyles Award hardware. The Sooners are the No. 4 team in the College Football Playoff and will take on No. 1 Clemson in the Capital One Orange Bowl on Thursday, Dec. 31, at 3 p.m. CT.